Complete editions seem to be the norm nowadays, especially in the case of Debussy’s piano music, so it’s refreshing to be able to welcome an old-fashioned recital, particularly one as successful as this. Angela Hewitt has chosen a well balanced programme, and writes comprehensively about it in a most readable booklet essay that includes many snippets of information that I hadn’t come across before. This being Hyperion, the presentation is so comprehensive that you can read it in French or German as well if you feel so inclined. The recording, in a lightly reverberant church acoustic, is just the job. Children’s Corner opens with the spoof piano exercise “Doctor Gradus ad Parnassum”, and it’s a very diligent pupil playing here, very fast, regular and accurate in the opening semiquavers. I wish I had pupils like that! As the young player’s mind starts to wander, and the fingers start to wander, Hewitt doesn’t quite achieve the uncanny, almost cinematographic realism of Michelangeli (DG, 1971), but then, who does? Michelangeli is similarly magical when Jimbo finally dozes off at the end of the second piece, but Hewitt is no less persuasive in her own, more overtly expressive, way. The doll’s serenade is quite clipped, missing out on some of the tenderness perhaps, and there are comments to make about each of the remaining pieces, as this is a performance full of insight that frequently presents music that one has known and loved for many years in a new way. Angela Hewitt writes that the Suite bergamasque has been a favourite of hers since she first played it at the age of fourteen. I was interested in this, because I have never quite been able to take to it. The titles of three of the four movements lead us to expect something along classical - even Baroque - lines, with the one remaining title, “Clair de Lune”, apparently the odd-man-out. To my ears, Angela Hewitt finds something close to the perfect balance between pure classical/Baroque sensibility and the opposing world of Commedia dell’arte represented by the second word of the title. The opening call to attention, for example, is broad and sonorous, Hewitt clearly ready to respect the composer’s rubato marking, but at signal points throughout the rest the articulation is crystal clear, aligned with a most subtle use of the pedal. The famous “Clair de Lune” is played without any excess sentiment, though nobody would ever call it “straight”. Overall, this is one of the finest performances, perhaps the finest performance, I have ever heard of this elusive work. “Limpid” is a word often applied to Debussy’s first Arabesque - usually meant as a compliment - and to performances of it. It’s a very good word, in all its varying senses, to apply to Hewitt’s performance of the outer passages, though she beautifully brings out the improvisatory character of the middle section also. The second Arabesque, quite different in character, and a more searching work, is just as successful, the moment of calm shortly before the end is exquisitely managed. Danse is an early, minor work, though as I have written elsewhere, minor Debussy is pretty much major nearly everybody else. Hewitt approaches it as a major, if slightly frivolous, work. 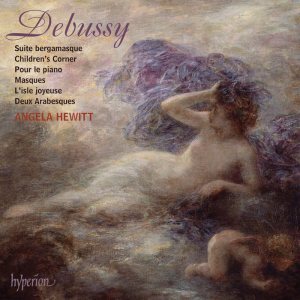 Pour le piano has long been one of my favourite Debussy piano works, and once again Hewitt is on top form. The opening movement is properly imposing, and she is very sensitive indeed to the melancholy aspect of the central “Sarabande”. Her performance of the closing “Toccata” is very exciting indeed, but there is a fierceness about some of the louder passages that sent me back to my preferred reading, that by Tamás Vásáry (DG, 1969). Without sacrificing anything in the way of power, he gets closer, especially in the sonorous, exultant middle section, to Debussy’s ideal of “a piano without hammers”. The great discovery of this recital for me was Masques, a piece that has unaccountably passed me by in a lifetime of studying Debussy’s piano music. It is a brilliant yet sombre masterpiece, and Angela Hewitt is the finest of advocates for it. She turns in a fizzing performance of another of my favourites, the magnificent L’isle joyeuse, and one which perfectly reflects her view of the piece as one “whose tremendous energy needs to be held slightly in check … before the outburst of unbounded joy.” There then follows a long pause - this disc can easily be heard and enjoyed in a single sitting - before the delicious, nostalgic, slightly tongue-in-cheek, but no less touching for all that, closing waltz, La plus que lente.